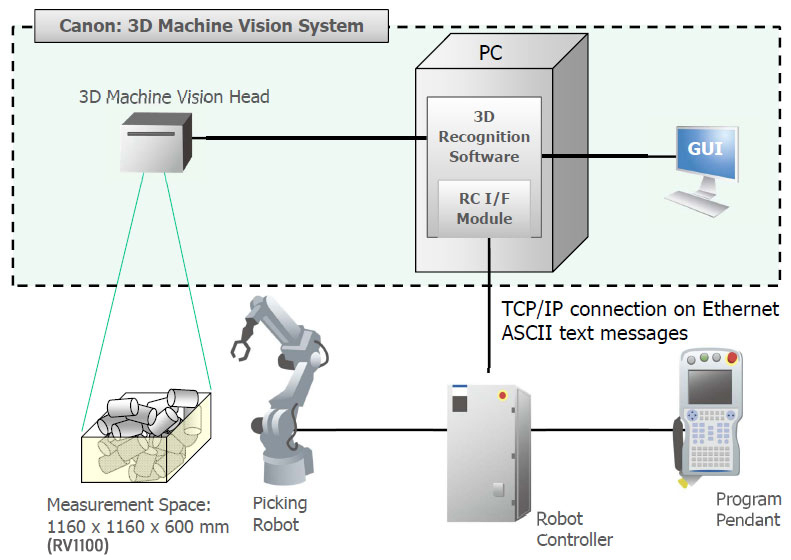 The 3D Machine Vision is a vision system designed to work with robot system as an eye to capture images of target parts randomly placed in a bin, determine the best pick, and guide the robot on how to approach, pick, and place the for its destination quickly but surely. It is a total automated solution for random bin picking empowered by Canon’s leading optical and processing technologies. 45.7x45.7x23.6 inch See red framed area below. *2 It requires to turn on “Recognize as thin work” parameter. Please fill out a brief survey to download brochures. Using a single captured image, this option enables position and orientation recognition of work pieces piled in multiple pallets. This option enables consecutive recognition upon confirming that the pile state remains unchanged after each work piece has been picked. This option enables the creation of dictionaries, required for the recognition of new work pieces, on a PC other than the PC connected to the 3-D Machine Vision Head. Using partial CAD data, this option enables recognition of parts even for large work pieces that extend beyond the measurement range. This option enables measurements from multiple locations by moving a slider-equipped 3-D Machine Vision Head. Canon has introduced new RV1100+ to support pallets larger than the current measurement field of RV1100 to meet wide-ranging part-provision needs of production lines. RV1100+ measurement field expands by 71.4% compared to that of RV1100. It allows to use much larger pallets yet still guarantees accuracy and calibrations within the expanded area. Otherwise, please contact one of our Regional Offices below for additional information.